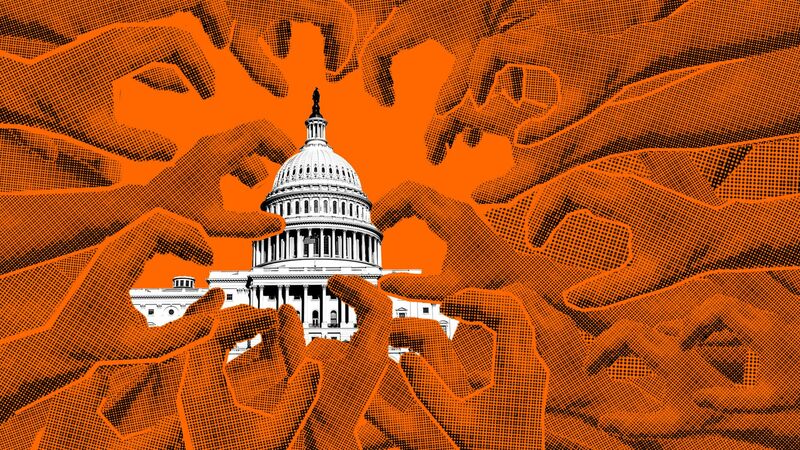 The most raw, captivating and consequential drama in American politics will unfold on Capitol Hill this summer: the race among both Democrats and Republicans to be party boss — and king or queen of Congress. Jim VandeHei and I have been covering politics for 20-plus years, and nothing exposes the ambition, game-playing, back-scratching and winner-take-lots of politics than congressional leadership races. There's scheming, lying and the naked display of human nature. You're running against your ostensible friends — and finding out who your real ones are. And thanks to Paul Ryan’s retirement and Nancy Pelosi’s polarization, the leadership of both parties is now in play. Just as control of the entire House is in play. The latest palace intrigue among House Rs, per reporting by Jonathan Swan and me ... The current #2 is Majority Leader Kevin McCarthy (Calif.), the favorite to succeed Ryan — despite being denied the office once before — especially because he's so close to President Trump. If McCarthy can't get enough votes — possible, given opposition among the conservative Freedom Caucus — then the most likely pick would be the current #3, House Republican Whip Steve Scalise (La.). Scalise won’t (directly) challenge McCarthy for the top job, but will step into the void if McCarthy falls short — or thinks he will fall short because Scalise allies tell him so. Scalise is viewed as more conservative and ideological. McCarthy is a political animal and massive fundraiser. President Trump, who has mused about making McCarthy his chief of staff, could pick the winner. McCarthy’s weakness is hard-right Rs, so Trump’s endorsement could prove decisive if it ever came. Another possible behind-the-scenes drama: Ryan said he plans to remain in office through the election, but will members let or want him? 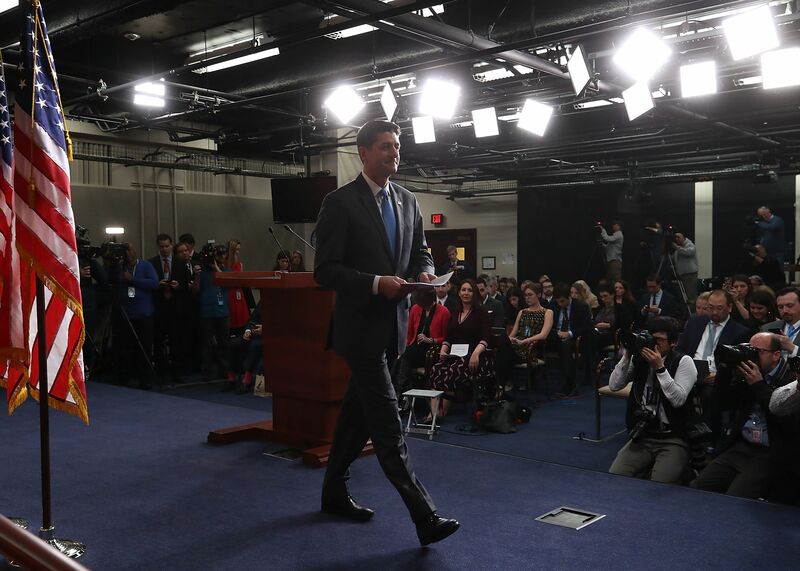 A former top Republican aide on the Hill tells us: "Donors won't give him another penny. Members won't take a tough vote because he asks. The idea that he would lead us into the most difficult midterm election while looking for another job is alarming." And among the Ds ... House Minority Leader Nancy Pelosi should be a sho0-in to keep leading Democrats if she were not so radioactive in swing districts. Rep. Joe Crowley of Queens is viewed by Dems as a plausible alternative because a growing number of Democrats in swing districts are pledging to oppose her to prove they are not super liberal. If enough swear off Pelosi, she might be forced to step aside even if Democrats win the House. Be smart: With a record number of women voting, after a record number of women ran, after a presidential election that saw the first woman win the popular vote but lose the White House, it will be very hard for Democrats to deny Pelosi the speakership. Be even smarter: Being speaker is a much better thing to say you do, than to actually do. The power of leaders has been drained by the rise of social media, outside money and polarization. That’s why the last two — Ryan and John Boehner — quit with relief. One source close to leadership told us: "Scuttlebutt is that Paul will have to step down from speakership soon. Members won’t follow a lame duck, he’ll have no leverage to cut deals, and the last thing they need in this environment is 6 months of palace intrigue and everyone stabbing everyone else in the back." The bottom line: It's clear that lawmakers haven't coalesced around a regulatory end-goal, even though the threat remains. Confusion over the digital ads ecosystem. The trust gap: Zuckerberg kept apologizing for the "breach of trust" and said the company would be more responsible. Be smart: Zuckerberg had a better-than-expected performance. He confidently answered questions, patiently explained the same thing over and over, and was deferential yet decisive with critics. 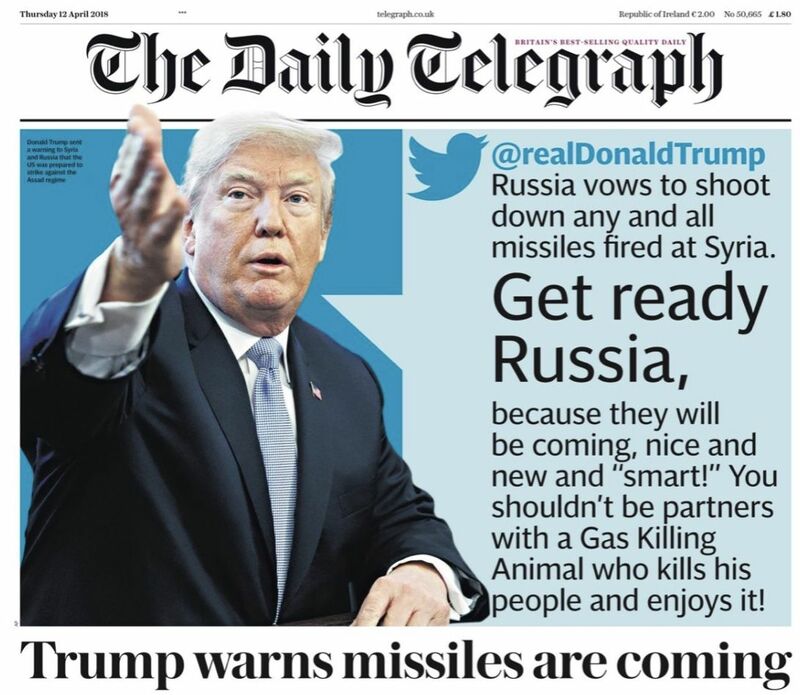 A London front page this morning. P.S. 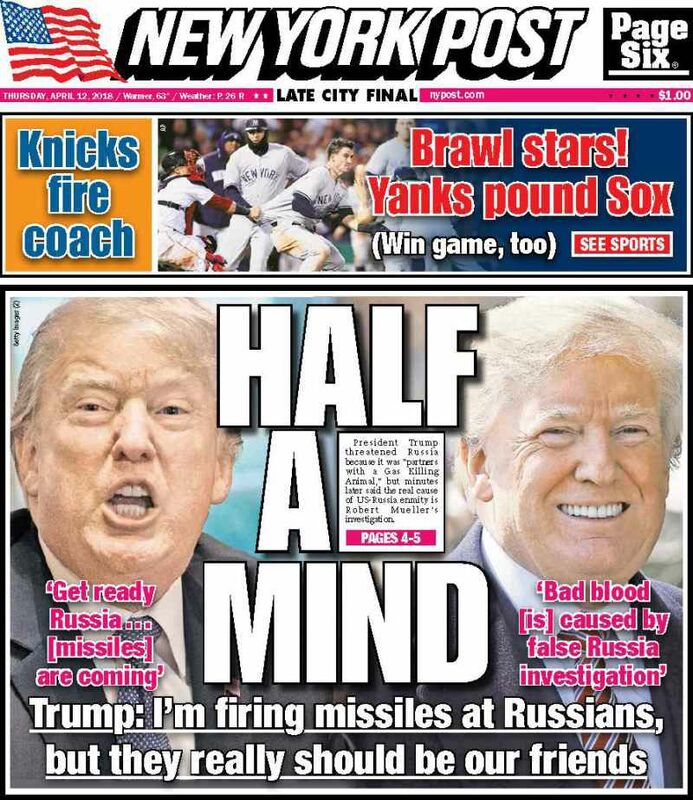 USA Today lead story: "U.S. military officials are probably planning for a larger, more robust strike than the one U.S. warships launched April 7, 2017, in response to the Syrian regime’s use of chemical weapons, said a former senior Defense official." "Russia continues to act aggressively, enabled by years of soft policy toward that aggression. That’s now over." 5. 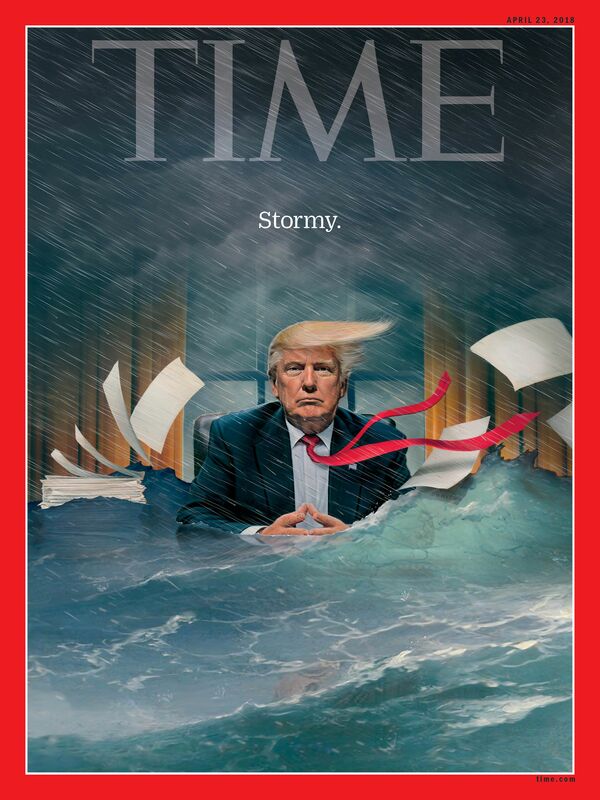 "Perfect storm: Trump faces escalating crises of his own making"
TIME's Brian Bennett: "Much as ... Paula Jones’ harassment case against Bill Clinton helped drive his impeachment and the seizure of Anthony Weiner’s laptop led the FBI to reopen its probe of Hillary Clinton, Trump’s personal history now may threaten his presidency." "The first step ... would be for Trump to fire Deputy Attorney General Rod J. Rosenstein." "Bannon is also recommending the White House cease its cooperation with Mueller, reversing the policy of Trump’s legal team." "As the 71st anniversary of Jackie Robinson breaking the major league color barrier approaches Sunday, MLB said the percentage was up from 7.7 last year and 8.27 the previous two seasons." "The percentage peaked at 19 in 1986." "Major League Baseball attributed the increase at least partly to its efforts to increase baseball youth participation with programs that include Urban Youth Academies and Reviving Baseball in Inner Cities (RBI)." 'This is their new life, traveling the country advocating for gun control, all while trying to keep up with their studies." "They are also trying to register as many teenagers as they can before November's midterm elections." Why it matters: "Some of the students said they're struggling to find balance as grassroots leaders and students with homework, Advanced Placement exams and college applications." "They've outgrown an office donated by a Stoneman Douglas parent and are moving to a new, secret location after their past address was leaked to the press. Most of their engagements are now handled by a professional booking agent and a public relations firm." 9. 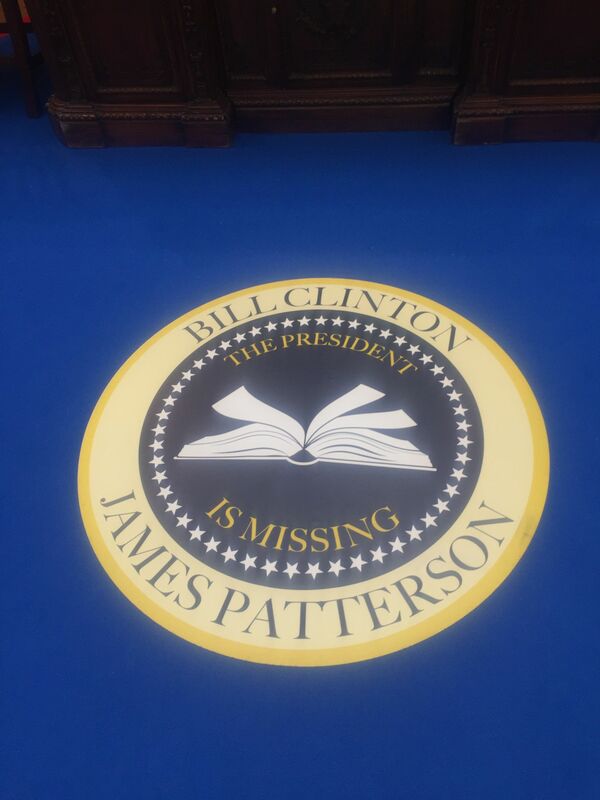 Pope acknowledges "grave mistakes"
Ahead of the June 4 U.S. publication of the "The President Is Missing," a joint novel by President Bill Clinton and the prolific, bestselling thriller writer James Patterson, the U.K. publisher built an Oval Office replica at this week's London Book Fair. Thanks for reading! See you all day on Axios.com.